Photos courtesy of Jeannemarie Photography. 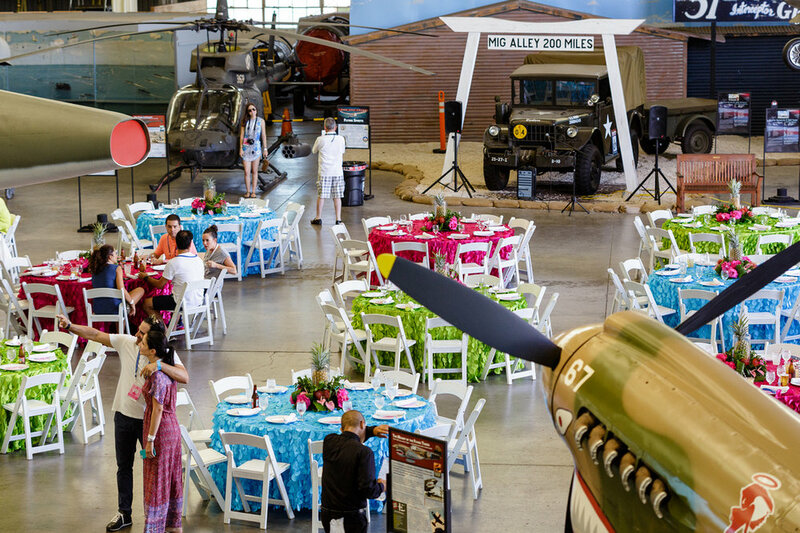 For a recent group visiting Oahu from Mexico, we held lunch at the iconic Pacific Aviation Museum. 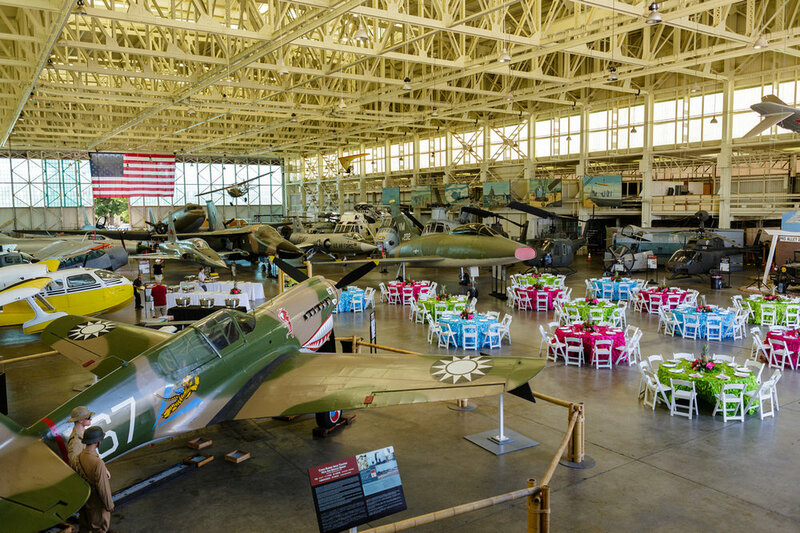 Guests enjoyed the opportunity to learn about the WWII vehicles that surrounded the space from docents on site while relaxing over a bountiful lunch. The lunch took place between tours of the USS Missouri and USS Arizona Memorial. 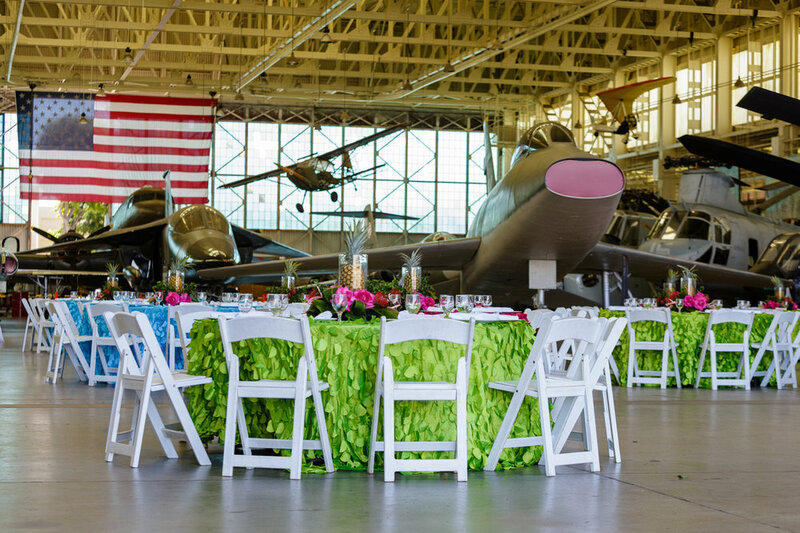 We decided to brighten the airplane hanger space with colorful linens and centerpieces that were not the stereotypical patriotic look. Period music from 1940's played in the background to further enliven the energy of the space. Guests LOVED this wonderful setting! Whatever you do, do it well. Often we are asked to create environments that are experiential, and it is then that we look to add elements that are unexpected. The mixing of the obviously patriotic with the whimsical linen and flowers added a touch of color, texture and unexpected luxury to this very beige and unique venue! Adding Health & Wellness to Your Hawaii Incentive Program! As a DMC in Hawaii, we are fortunate to live and work in “paradise.” When we are not hard at work event planning, creating exciting activities, and managing arrivals & departure manifests, we too are enjoying the health benefits of Hawaii. Not only does Hawaii offer an exotic destination within the US, it also offers unique and diverse health and wellness opportunities. For many high achievers, being part of an incentive program that includes a winner’s trip to Hawaii means working hard to reach corporate targets. Some may miss meals, family time, daylight, and exercise - all in pursuit of the amazing incentive trip! But missing these things takes a toll on one’s health. Why not use your incentive trip to help your guests re-connect with a healthy lifestyle? The key to enjoying one’s health is partially based on customizing experiences to the individual. Make it a fun and experiential part of their lives, and they will embrace it! Time: offer your attendees a commitment of time and facilities on the incentive trip to be healthier and active right here in Hawaii! Diversity: Offer all types of exercise and offer some ways for guests to rejuvenate such as yoga or meditation classes - maybe on the beach at sunrise. Create a daily FUN and FREE exercise option. Offer this for all attendees and make them fun! Vary the exercise level and intensity so everyone can find an appropriate, enjoyable option. Offer exclusive group activities such as Kayaking and individual activities such as personal trainers & fitness evaluations with certified trainers. Check in with the Resort: your host resort may already have some wonderful on property options for you - if not, let us know and we can create some! Returning to Hawaii with an Annual Incentive Program? For so many reasons, Hawaii is consistently rated as one of the top destinations for incentive programs in the world. It could be the weather, the tropical locations, or the people and the spirit of aloha. Most likely, it is all of the above , but what do you do, as a planner, when you must bringing your top performers back to Hawaii year after year? How do you continue to provide new and exciting elements while staying in budget and not duplicating previous programs? We have learned to capitalize on the many ways that Mother Nature continues to bless our islands. Each island has so many fantastic outdoor activities that can be safely done by diverse groups. There’s no reason to repeat anything! Every group wants to have some iconic elements of Hawaii included as part of their program. But as a planner, you don’t want to duplicate the experience for what could potentially be the same guests each year. 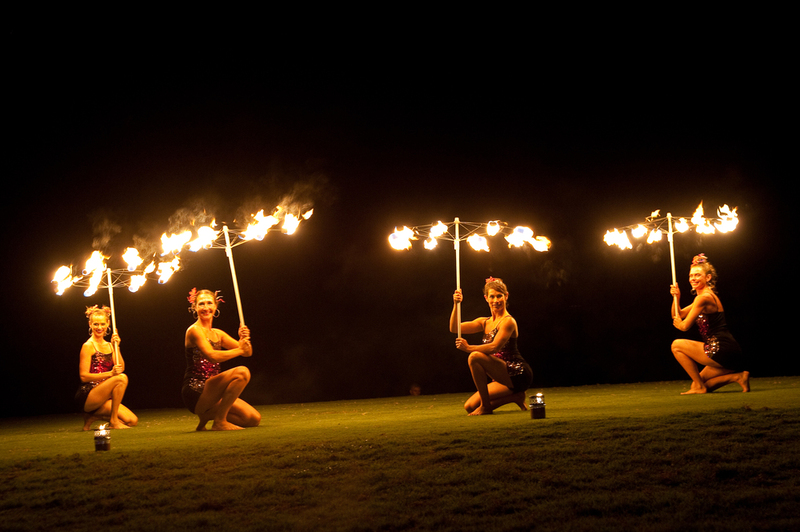 As it relates to evening event design, we refer to this practice as offering “Luau #7 with a side order of fire dance” – or offering the same performance to everyone all the time. As great as that luau may be, this duplication will fast become a less memorable experience for your guests. Instead we offer a customized “Polynesian Experience” that can change story line - perhaps incorporate aerialists or acrobatics or female fire dancers – all with a Polynesian flair. We guarantee you a new, fresh, and exciting interpretation on the iconic Hawaiian experience. It sounds simple, but as a DMC, we keep great records for our clients. We track what our group guests do, what they liked, disliked or loved doing on their incentive program in Hawaii. From direct guest feedback, to behaviors such as sending emails during the grand finale set, we notice these details which is very important to the returning client. Our record-keeping allows us to create a personalized program for your group, incorporating the best parts of last year’s trip combined with new and exciting, and relevant elements. This practice also allows us to be knowledgeable when working with new clients, to be able to speak with experience about the pros and cons of every element of a program. When you least expect it … expect it! As a luxury focused DMC we recognize that life is a collection of experiences. We are in the business of creating experiences. Taking the day-to-day trappings of life and adding a bit of a spin to them is what keeps things fresh. Part of building any experience is playing on the element of surprise. A snow storm at an evening event to announce next year’s venue! Elvis singing Blue Hawaii while arriving by outrigger canoe to your gourmet dinner on one of Hawaii’s only “private” beaches! If we can help make your first or your returning Incentive program in Hawaii a huge success, please let us know! A free consultation is just a phone call away. Contact us to schedule a time to talk about your upcoming!